This is the same temple I used in "The Prayer" so please view that image for my comments about the temple, lighting, and reflections. The Goddess figure is facing towards the priest. (i.e. Her back is facing you.) 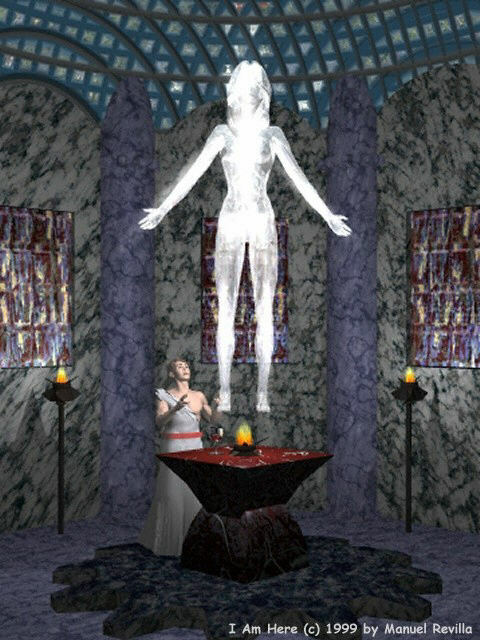 She was rendered using a glowing water texture and is illuminated by eight low intensity light sources. The end result far exceeded my expectations. This is the image that finally caused me to build myself a new computer. My old 200MHz Pentium MMX kept crashing. On a Pentium II Celeron the render times where 18+ hours at 300 MHz and 11+ hours at 450 MHz. I Am Here is copyright 1999 by Manuel Revilla, all rights reserved.